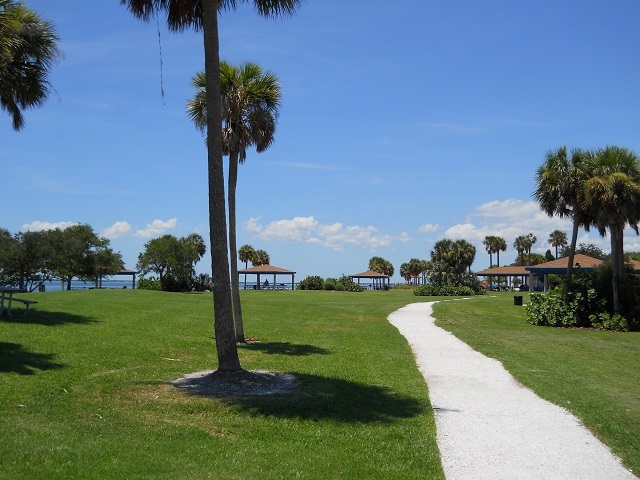 This family friendly park in Tampa has great amenities and great birding! Start at the 350-foot fishing pier; winter is a good time to scope for Common Loon, Red-breasted Merganser, Redhead and Lesser Scaup. Next, walk or drive the entrance road, looking for wading birds like Wood Stork, White Ibis and Great Blue Heron in the tidal creek. Yellow Warbler, Eastern Wood-Pewee and other songbird migrants seek food and shelter in the mangroves and hardwood patches during migration. From the southern parking area, a paved path leads to an observation platform at the south tip of the island. In spring/summer, Gray Kingbirds can be found and Loggerhead Shrikes are present year round. Gray Catbird, House Wren and Eastern Phoebe are present in winter, as are Nelson’s, Savannah and Swamp Sparrows. The beach areas and tidal flats attract Brown Pelican and shorebirds like Dunlin, Ruddy Turnstone and Sanderling; look for Semipalmated Sandpiper in April/May and American Oystercatcher in winter. Royal Tern, Caspian Tern, and Black Skimmer rest on the park’s beaches throughout the year.